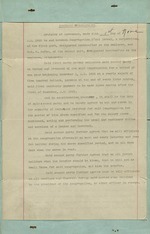 Employment contract beginning on Nov. 1, 1923 for an annual $500 salary. "'. .." ,. B-. ..
-,_ .. .. i .
COIiTR. CT (?PF F'PLO,. 'i, ,-:iiT. first of NTovemnber, A.D. 1923.
and services of a Cantor and'Reverend. days when the scrow is read. SBwall Tokea for said congregation, and blow the schofar. beitr-c first .zivcn to ssi'1 se-cond party. congregation by said see ond party. collected by him for said congregation. whenever said f first party so desires, upon first notifying and. advising said. second party of the action of sid first party. to said congregation be not required.